Every fine wine has a story, including yours. Custom-designed for winemakers, this journal helps you track your formulas, fermentation facts, and results in style. Bound in warm vegan "leather," the handsome book includes engaging infographics, handy tables, and systematically structured log pages to guide your home winemaking pursuits. It's a detailed, indispensible resource that's adaptable for a range of vintner expertise, and may also be used for making mead or cider. Made in China. Beautiful wine makers journal for the serious wine maker. I make wine frequently and like to keep detailed notes to ensure consistency. This journal is perfect for tracking all aspects of wine making from ingredients to process. Really nice references are also included in the journal. The journal is beautifully crafted. Wish I had seen it years ago! Pleased with the great quality of the product. There's nothing I didn't like about it. 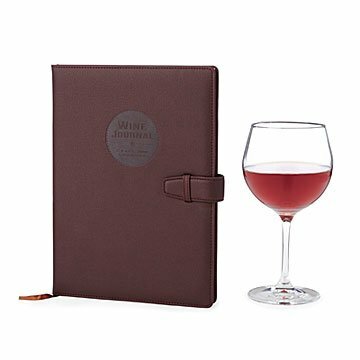 The leather cover sets it a part from other wine making journals, the headings make it user friendly and easy to look back on past batches, and looks elegant enough to be left out and not hidden away. I keep detailed notes during winemaking so that I can recreate my favorite wines. This journal will make the process an easier task since I will be prompted to add details that I might otherwise forget. My current notebook is a bit messy and not near so user friendly as this journal. Great product. We recently began making wine at home. This allows us to keep all documentation in a convenient binder. Plenty of room for all information. "He liked it, he really liked it"
This was a gift for a person who makes his own wine. He said "This is one gift I fully intend to use!" THIS WAS A GIFT FOR MY SON IN LAW AND HE WAS VERY PLEASED. HE ASKED WHERE I FOUND IT. a terrific way to keep track of all the beer receipes that I tend to play with by adding my own ingredients or tweeking them a bit. I just started making my own wine. This is a wonderful resource and book to journal each time i make wine. This journal is custom-made to help home winemakers record their activity.